Friend Neil sent me this recently. Neither of us had ever seen it before. Back in 1991, as Dahmer's story played out in media around the world, the sleazy tabloid National Enquirer somehow acquired the unaltered National Honor Society group photo from our senior yearbook, the one with Jeff's face famously blacked out. Needless to say, I was not reading the supermarket tabloids back then for their Dahmer coverage, so I missed this when it originally appeared. At top is the photo, as originally snapped. At bottom is how it appeared in the yearbook, blotted out by the NHS advisor when she saw we had snuck Jeff into the picture. I depict this scene in MFD. IN 1991, as the details of his sad, young life emerged, this photo became a symbol of his wasted youth. The boy who didn't belong. 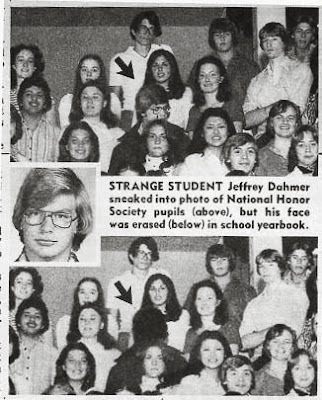 The truth, of course, was the Dahmer Fan Club had arranged the whole thing, as part of our campaign to sneak Dahmer into every group photo in the yearbook. Jeff enthusiastically played along. So it wasn't really a symbol of Jeff's ostracism and isolation from high school society. It was, in fact, just the opposite, evidence that he had friends and participated in typical, teenage, goofball antics. The question Neil and I have now is where did this unaltered photo come from? Neil was a yearbook photog, but he didn't take this particular photo. He was, in fact, in it, since he was a member of NHS. The kid who took the photo says he didn't sell it to the Enquirer either. The print used in the yearbook was altered with a marker in the yearbook office in the high school. This was long before desktop publishing. Photos were sized for each page layout and then sent to the photography studio to be made into a halftone. After that it it was pasted onto a make-up page, along with the type. Then the whole page was shot as a negative and that was used to make the printing plate. Yeah, it was a lot more complicated. Our best guess is that the owner of the Akron photo studio, the one that did all the pre-press work for the yearbook, and took all the school portraits, had the original photo negatives in his files and sold it to the Enquirer. This would have been 13 years after our senior year. It was also long before digital images and storage, of course. These would have been film negatives, stuffed in a file drawer, originally as back-up and probably never thrown away. This studio worked for a number of school districts in the area. The portrait pic of Jeff shown here is also not one which appeared in any yearbook, adding to our belief it came from the photography studio. Curiously, to my knowledge, this is the only publication either of these photos appeared in! Seems like every photo of Jeff from his childhood, and there weren't that many, has been reprinted 1000 times. Not these. The altered photo did appear in one of the Hunting Humans true crime paperbacks. That was the first time I saw it. Picture always stuck with me, but very hard to come by.